Last Saturday I found inspiration in the beautiful greenhouse of Villa la Valverde. I started choosing the flowers and vases to use in the decorations the day before. I combined a range of different berries with Norway pine, moss and hyacinth bulbs. Berries are an absolute must for any Christmas decoration for their amazing colours and textures. I decided to resume a Swedish Christmas tradition. In December in Sweden all homes have bulbs and when the flowers blossom, the scent spreads through every room. Bulbs are very easy to take care of. You need to water the bulb and the flower every 3 to 4 days. When kept indoors they blossom after 10 days. When the flowers wither, cut the leaves and the flower and store them in a paper bag in a dark, dry place. You’ll be able to plant them either inside or out next year. As you can see from the photos, I used different types of bottles, small vases and other things that I found in the greenhouse to create interest. Always try to use at least 3 elements and dare to be different by making unusual combinations. For examples I put a succulent in a simple pottery pot together with an old wooden tool box which gave an unusual twist. Don’t miss my next post about Christmas table decorations! Have you put your decorations up yet? Send me your photos! Notebooks and gift wraps from Lino’s & Co. In the last few days I’ve been checking out the latest Christmas decorations. Out of the many Christmas images I was always attracted to a natural and cozy atmosphere. Do use a lot of candles, they help a lot to create a warm atmosphere. By the way the official date to start all Christmas decorations is the 8th of December, but we can start them a little bit earlier to make the magic last longer! Pine is the king of this season. In the shops, you may find two different varieties that don’t lose needles and last for all the period: Norway pine (bottle green colour) and silver pine (silver green). Not forgetting the very perfumed strobus pine. Silver and green cypress branches always remind me of vintage lace and will add an unusual twist. When dried, eucalyptus silver green leaves change to an ash grey colour. I personally love the silver berried eucalyptus as they look like little fireworks when blossoming. You’ll be spoiled for choice with berries: from pillar box red right down to a wide range of browns and burgundies. Moss is an absolute must for any festive occasion. Its softness will add a fairy magic to your home! Here are some photos of easy and interesting things to make. In a nutshell try to use different kinds of foliage to add texture to your creations. And don’t forget a splash of colour! Do you find this post helpful? Send me your feedback and photos about your creations. Some pics are mine, other from Pinterest! The romanesque parish church of San Giorgio Ingannapoltron was chosen, which was located in the beautiful wine area of Valpolicella. From the little churchyard, there was a stunning view of Lake Garda. The church itself with its little cloister is built from local stone and has a clear cut design. The couple wanted the floral decorations to be soft and graceful. I suggested flowers with a roundish corolla. The traditional winter flowers anemones and ranunculus were perfectly matched with the elegance of white roses and the softness of baby’s wreath. Seeing als Christmas wasn’t very far away I decided to choose dark green buxus to use in all the creations. Martina, picked a very romantic wedding gown with an ample tulle skirt. 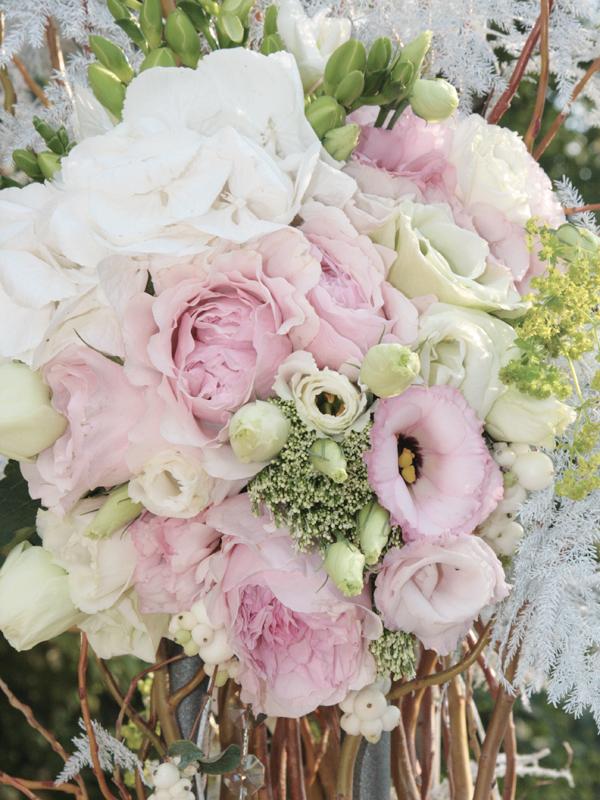 The perfect choice of flower for her bridal bouquet was light pink cloni ranunculus. The cloni ranunculus started to become popular a few years ago and is an absolute must for a winter weddings. This particular flower has all the elegance of an English garden rose and the beauty of a peony. The older they get the more beautiful they become; the blossom opens up more and more to reveal their silken petals. Just another word about anemones and ranunculus. Anemones are effervescent flowers with their black centres and the their delicate silk like petals. You’ll be spoiled for choice by the vast array of colours to choose from. Pillar box red to deep burgundy and right down to every shade of purple. There is a lot to write about ranunculus check out my blog for more information about varieties and colours. Which flower do you go for in winter? Drop me a line and let me know! These are our floral arrangements created for a wedding which took place at the beautiful Byblos Art Hotel, Villa Amist, in collaboration with Palazzo Eventi.